Need a replacement commercial John Deere Pulley, including Drive pulleys? Jack’s has them to help get your John Deere equipment running again. 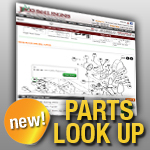 We’ve been selling lawn mower and small engine parts online since 1997, so when you need replacement John Deere Drive Pulleys, or any other parts, just go to Jack’s!